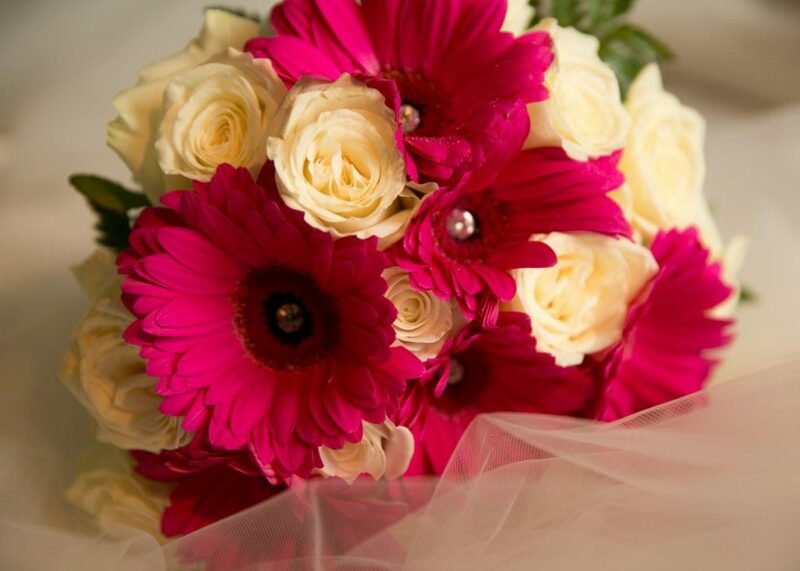 It’s Valentine’s Day so why not share the love with another Real Life Wedding. When the bride sent me the pics, I spotted someone I knew! I went to college with one of the bridesmaids Aimee! The world gets smaller and smaller especially when it comes to weddings. 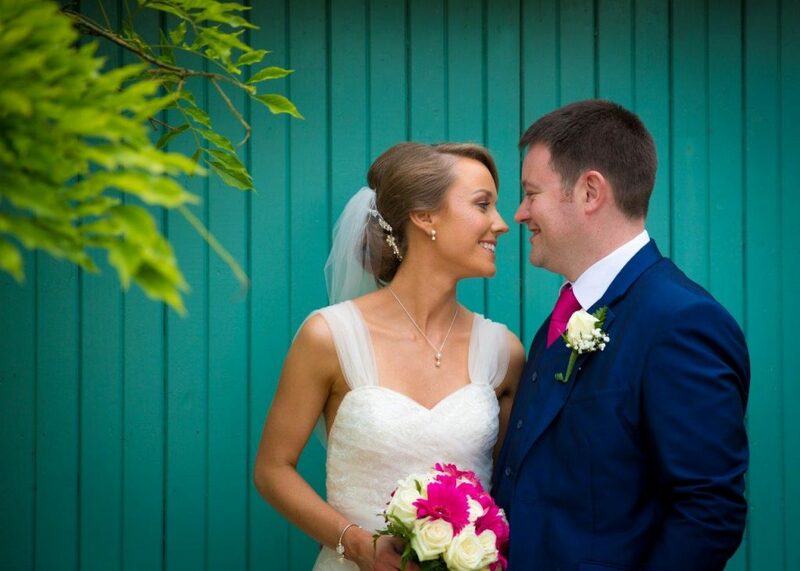 I hope you enjoy reading about Kay & Andrew’s big day! I really enjoyed planning the wedding. Obviously there were moments when I wanted to tear the hair out of my head e.g. the seating plan was defo one of them! My sister & bridesmaid Lorraine would probably say that I was a little too laid back when it came to planning. 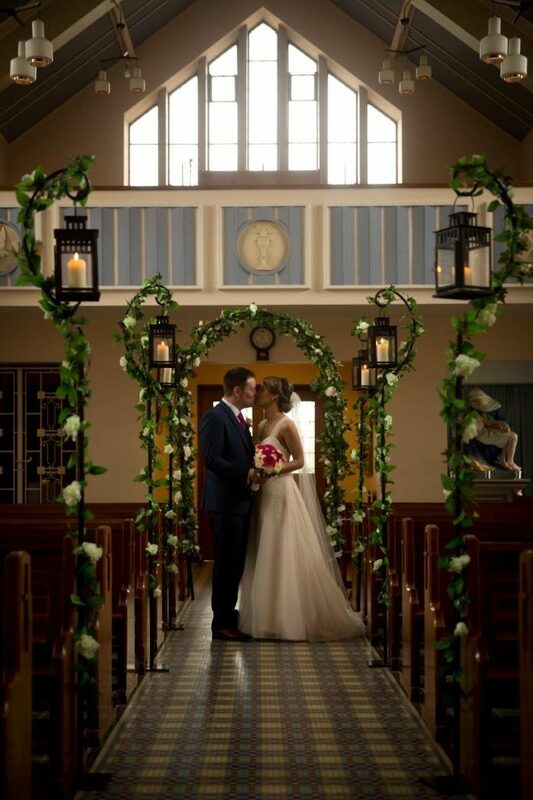 Deciding on the hotel was simple as The Falls Hotel & Spa was the only place I wanted as my reception venue. From start to finish I can only say great things about them. Michael & John were always on hand to deal with any queries. The service on the day was outstanding and the food was amazing. Also, I have to say having a theme also made it that bit easier too. 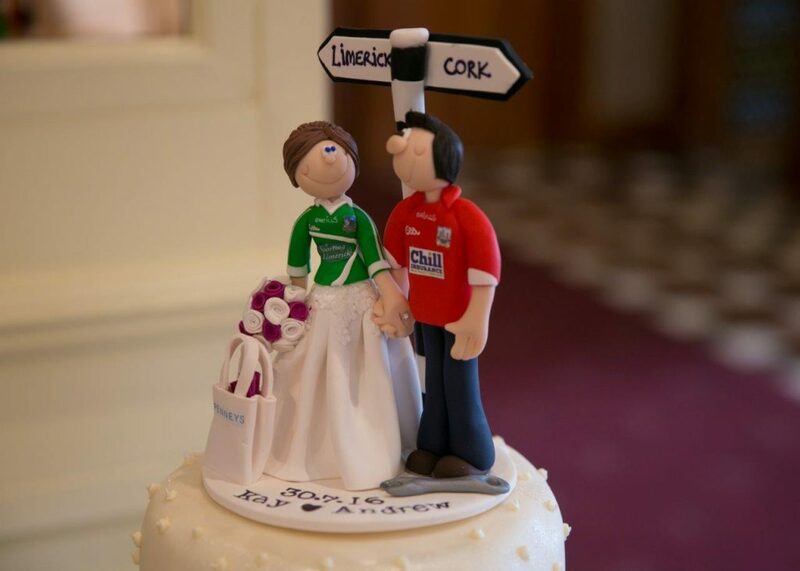 We had a GAA theme – Limerick V Cork as I’m from Limerick and Andrew is from Cork. It made the decisions easier when I knew what I was looking for. It made for friendly banter on the day too. 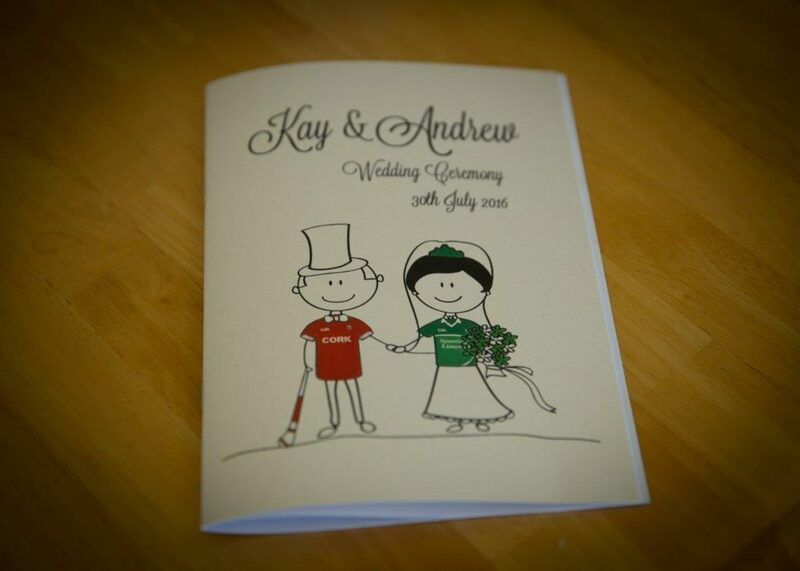 The colour theme was mainly green & red, we opted for GAA themed wedding invitations & mass booklets. I also got a lovely themed cake topper from Belle Cake Toppers. Pinterest is also a great app for ideas; I found it handy for cake designs, flowers & hairstyles. 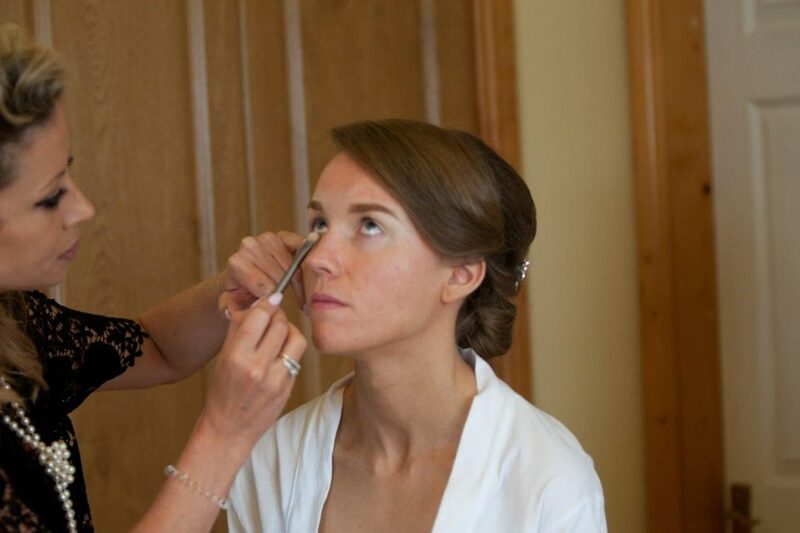 Was your groom/bridesmaid hands on? 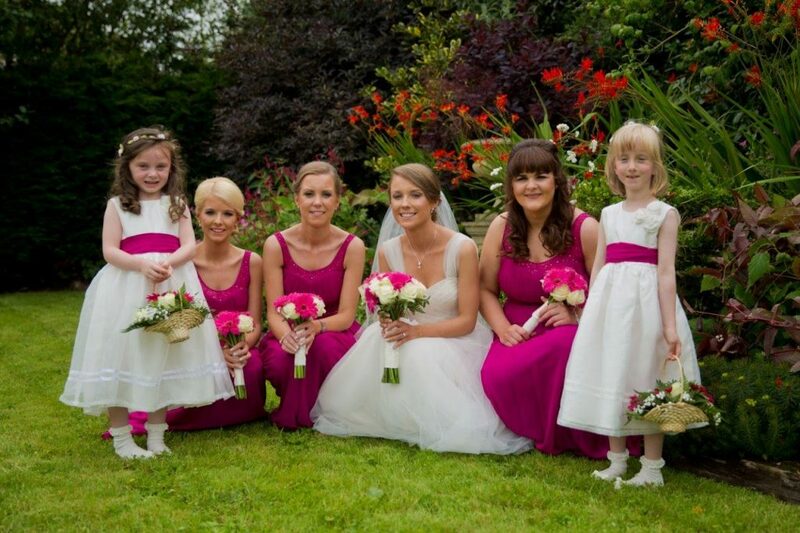 I had 3 bridesmaids, my sister Lorraine and 2 friends Fiona & Aimee. I would have been totally lost without my sister, she was really hands on throughout all the planning process, so much so she was named Bridesmaidzilla! Fiona was also great help, any problems she was always there. Aimee was living in the UK so it was harder for her but she played her part where possible. Andrew more or less left most of the decision making to me but was involved with the major decisions like the venue & wedding band. His main contributions were organising the transport and the ice cream van. 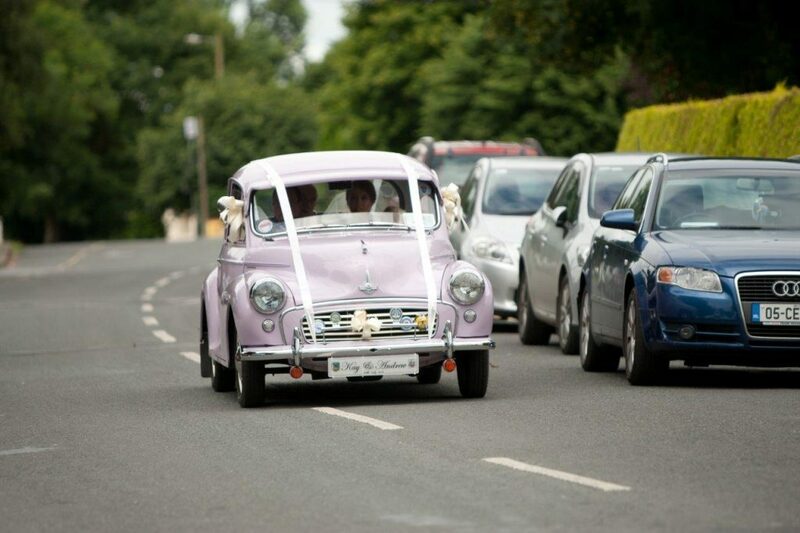 I came to the church in a beautiful lilac Morris Minor Million owned by my sister’s father in law. It was the same wedding car she used for her wedding day too. 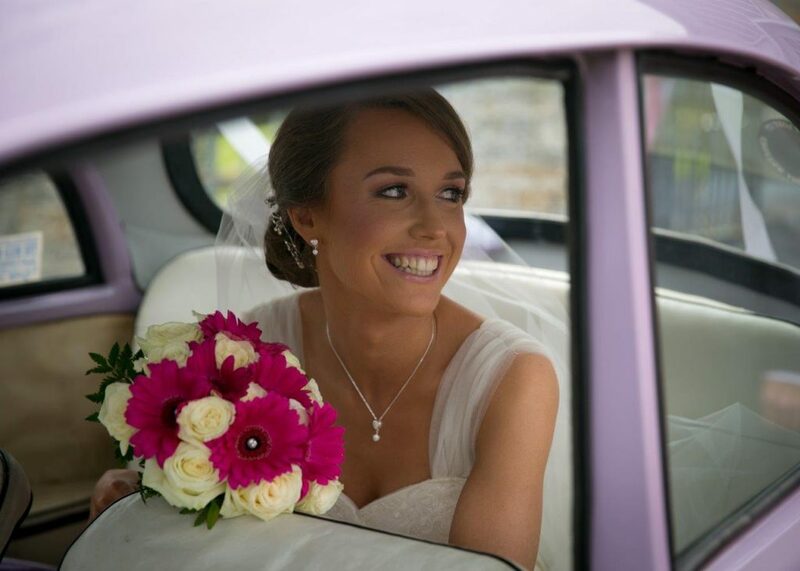 We then went to the reception in a beautiful white vintage Mercedes owned by a family friend. 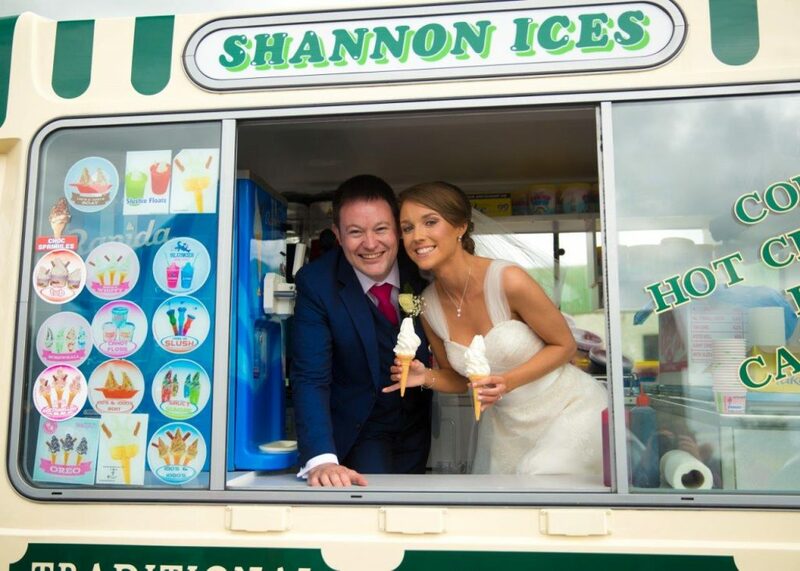 The ice cream van was a really big hit on the day so I would recommend it to future couples. It was a novelty for people after the church. 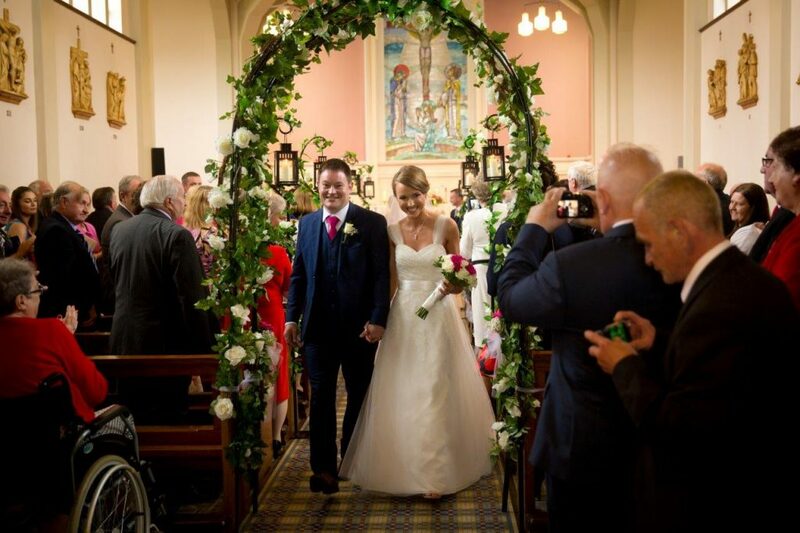 There were no major hiccups on the day which was great, we even got sunshine which in Ireland is totally unpredictable even though we got married in July. This is a difficult one! I enjoyed the drive to the church with my Dad but then I turned into a nervous wreck when I got into the church and saw everyone. I was very emotional which I didn’t expect to happen to me at all. Once the nerves settled, I was ok. 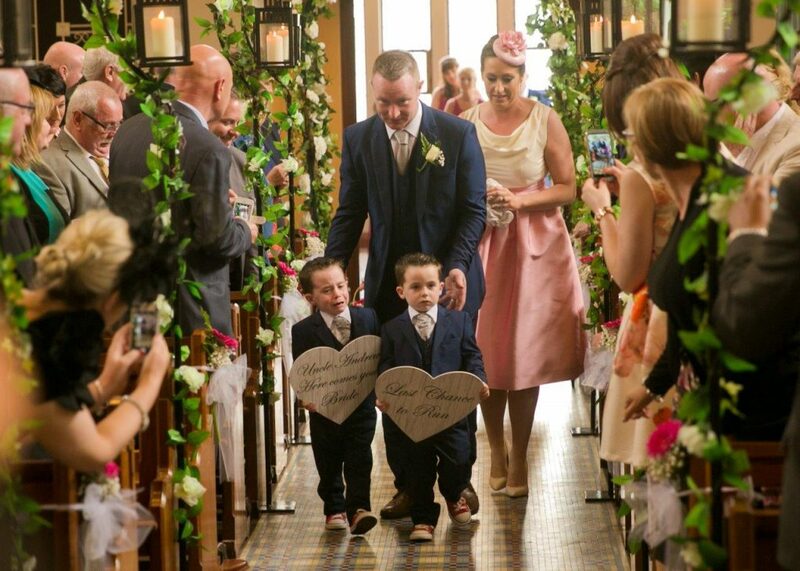 It was great to walk down the aisle together knowing I could relax for the rest of the day. It goes so fast so every minute is to be enjoyed. Andrew’s highlight of the day was the wedding ceremony, he was delighted to see me arriving especially since I have 30 minutes late! To be honest there really isn’t anything, I think the fact we had 2 years to organise everything it made it less stressful. We got most the suppliers that we wanted for the day which was great. 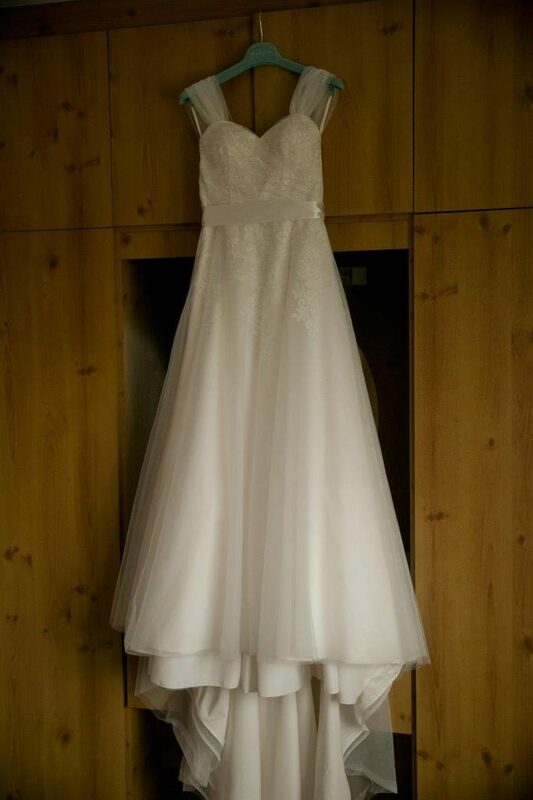 We had a fantastic day and would love to do it all over again. There are only small things that I would have done differently. I regret not bringing the videographer to the drinks reception as we missed this because of the photographs being taken. I never got to hear the jazz trio, The Conor Ocean Trio, we had booked and would have liked to have been able to see this on the DVD after. I think having a second day is a good idea, we had a BBQ the following day and it was really relaxing & laid back. We were able to chill out with family & friends. 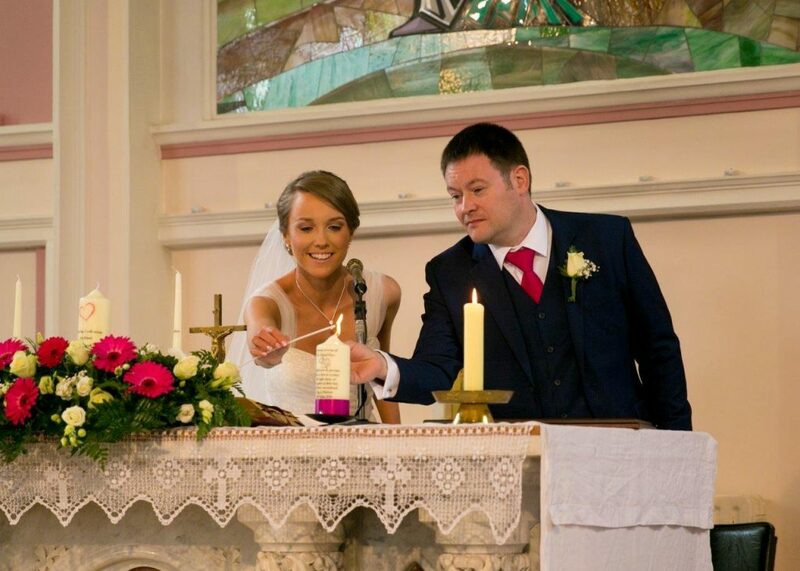 I got my wedding candles from Bunratty Candles and they also made a remembrance candle for me. I had never heard of these before. 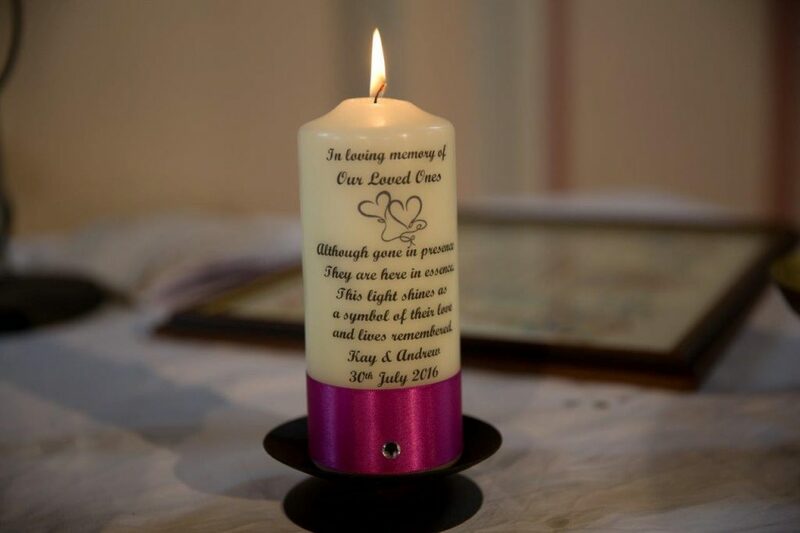 It was a great way to remember family members who were no longer with us on our wedding day. Vows Wedding Shop were just after opening when I started to look for bridesmaid dresses and I could not believe the amount of choice they had and the great value. 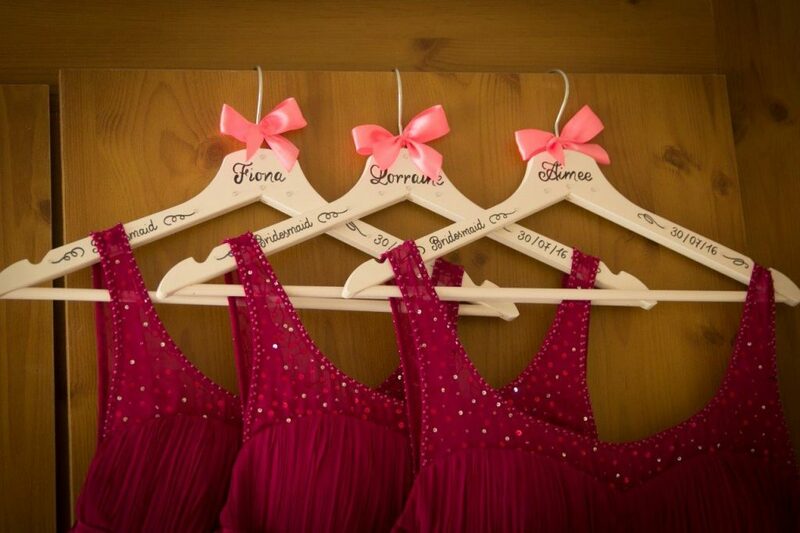 There are a one stop shop for wedding dresses, bridesmaids, flowergirls, pageboys, mother of bride and accessories – everything you could need under one roof! We did an engagement shoot with our photographer before the wedding. It was a great way to practice before the big day and it also made us more familiar with what to expect on the day. We used one of the pictures taken that day to use as a signing board for the wedding day. It’s now a great memento that’s framed up on our wall. 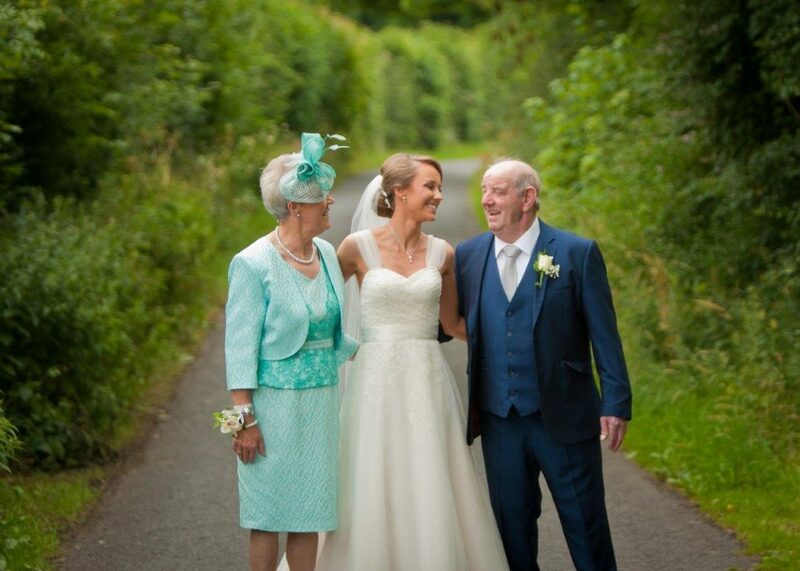 Thanks so much to Kay and Andrew for sharing their day with me. Now who wants an ice cream? 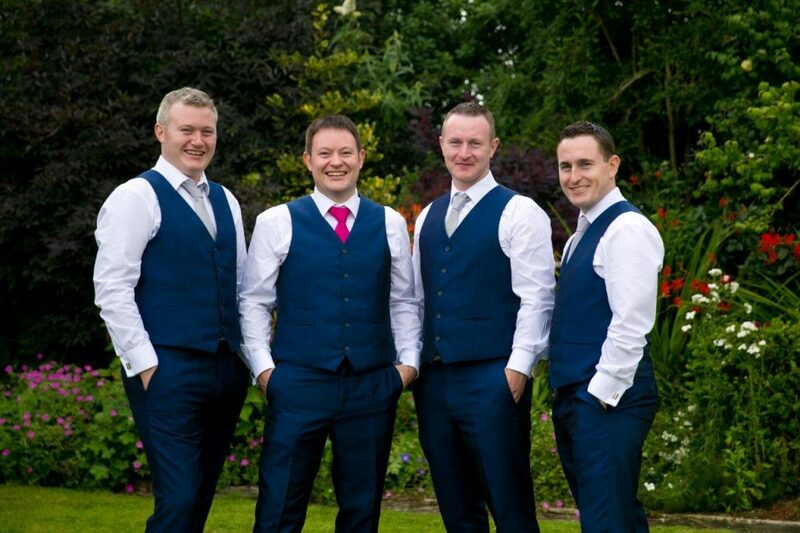 ← KBC WedFest – An alternative wedding event!